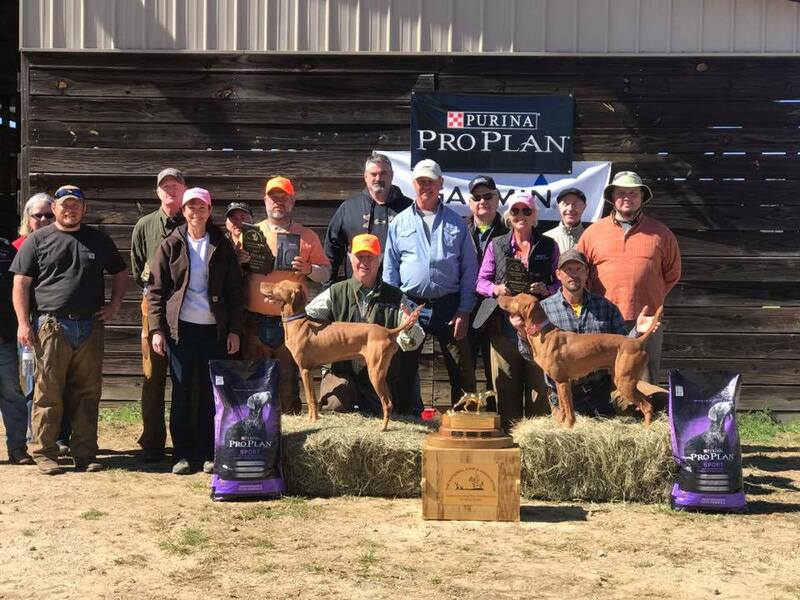 The National Vizsla Association Eastern Shooting Dog Championship and Derby Classic were held at Di-Lane Plantation in Waynesboro, Ga. The trial drew dogs and handlers from Wisconsin, Illinois, Indiana, Minnesota, Ohio, South Carolina and Georgia. Di-Lane has a long and rich history in the bird dog field trial community and this represents the seventh or eighth time our Eastern Championship has been held on Di-Lane. A special thank you to Nestlé Purina for sponsoring this event and for all they do for this field trial sport. Purina Pro Plan product was awarded to placements and winners. Purina representative Terry Trzcinski was on hand and we particularly appreciate all he and Greg Blair do for the NVA. Additionally, Garmin maintains their official sponsor support role at this and all of our national and regional championships. The Georgia Department of Natural Resources site management crew deserves a big thank you for their continued dedication to these grounds and support to the quail population. Tippe and Jamie Fountain, along with Mark Johnson, were key to the success of this event. They saw to care of birds, early morning salting of the course, attending judges’ needs and delicious Southern meals. Mike and Sherry Pharris for operating the dog wagon and picking up any extra chores — always with a smile. Kent Patterson and Rob Donahue from Tennessee occupied the judicial saddles for both stakes. Their attentiveness, time and effort were appreciated. The weather promised heavy showers on opening morning and as the front worked its way east the sun came out and though the temperatures were climbing to the 70s by afternoon it was a stunning setting at Di-Lane. A favorite each year is the low country boil prepared by Tippe Fountain of East Dublin, Ga. Coffee, pastries and scrambled eggs made for a good start each day. Lunches were just a sample of good things to come. Jambalaya served and paired with a new dessert — Ho Ho Cake. Thank you, Tippe. From start to finish you make everyone welcome and well fed! The 2017 winner, Tibercreek Billy the Kid (Pete), owned by Mark Calder of Frederick, Mo., and handled by Jamie Fountain, had two finds, staunchly standing stylishly, plus a back with good manners on all. Pete’s run exhibited strength and power from the beginning to end. Immediately to the front, moving boldly off the starting line, Pete showed solid purpose at Merry Mischief Road and impressed down the final set of pines to the planted and plowed fields at the end of the hour. Runner-up DuRite’s Covey Rise, callname Hootie, owned by Claude Roger Acuff, Jr., and Billy Ring of Martinsville, Ind., handled by Carrie Syczylo, had two stylish finds with good manners as his handler flushed birds from tall grasses. Hootie moved boldly with strength and purpose, particularly in the mid-section of the course, making good use of edges and long lines in the pines. Hootie completed the hour strong and forward. The winners were in brace No. 1; cool temperatures and rain did not deter either dog from success. The winners were awarded Purina Pro Plan Sport product, award plaques, and a Garmin training collar to the winner. Breakaway was at 9:06 a. m. on a cloudy, overcast morning with the promise of rain; temperature in the 60s. Tibercreek Billy the Kid and DuRite’s Covey Rise. At 10 near Merry Mischief Road “Pete” was found standing in deep cover, bird flushed and all in good order. Hootie moved forward along a left edge into the next field. Syczylo called point at 13. Hootie stood well, Pete backed. After the flush both dogs made strong moves beyond the first of several stream crossings. Rain began to fall during the mid-section of the hour. Down a line of tall pines and into large thickets Fountain called point at 29. Pete stood strong through a covey flush. Hootie stood at the midpoint of the course when his handler called point at 34. He was tight through flush, then made a bold move off the right side in dense cover. Pete grabbed the front, and at 40 stretched the distance along a long stretch of pines bordered by tall grasses. Each dog completed the hour forward and running strong. Remy Martin Long (Jamie Fountain) and Meyer’s Bella (Syczylo). Winds picked up and the promise of thundershowers soon arrived. Bella was pointing at 10 in thick cover near Merry Mischief Road. Birds flushed, all in good order. At 12 Fountain called point in the second field of grasses where Remy displayed good manners and style. The rain came down hard but it did not deter the dogs. This reporter noticed that Syczylo might have desired a rain jacket that was optimistically left behind. In dense grasses at 42 Remy pointed and Bella backed. Following Fountain’s request to relocate Remy, Syczylo moved Bella on. No bird located and Fountain took an unproductive. As the dogs approached the planted fields near the end of the course, each worked separate sections. Remy was pointing at 53 in a section of tall pines. With a relocation request, the dog pointed and stood through flush and shot. Both dogs finished the hour. Lunch took place before No. 3 ran. Appreciation to Tippe Fountain for her tasty fixings. Welcome Sunshine and temperatures in the upper 60s for the afternoon. Both Poquito’s Maracas De Rita (Fountain) and DuRite’s Indiana Jones (Syczylo) were hard off the line and forward through the opening sections of the course. At 11 Jones was standing at the Merry Mischief Road. Unfortunately, the birds proved to be a bit jumpy and his bid ended. “Mara” continued across the second open field, crossing the pipe line and two stream sections. It would not be until the last section of tall pines that Fountain spotted Mara standing. Mara stood well through flush and shot. At 50 Fountain opted to pick up his dog. A Casexx for JT Becker (Fountain) and Shiloh’s Red White and Blue (Robert Tomczak). Powering off the line, Case made it evident he was a contender. On a find at 18 in the third field Case showed style and held well through flush and shot. Crossing the pipe line and taking the piney woodsedges Case’s scout noted dog standing at 30. Fountain found his dog buried in thick briars. All good as the covey flushed from deep cover. Grabbing hold of the second half of the course, Case exhibited considerable power and an eye-catching ground race. At 56 moving into a section of woods and water, birds were up, ending Case’s bid. Blue drove hard from the start and carded a find at 39 past the pipe line. Standing staunchly in thick grasses a relocation was requested. With relocation Blue stood well through flush and shot. Flanked by two open fields Blue continued forward and point was called at 45. Tomczak opted to take an unproductive. Blue had a stylish covey find at 53 along a piney wood section. In the closing minutes Blue had a third find and completed his hour. Blue had pleased his handler. Saginaw Redneck ran as a bye. Off to a fast start, “Boomer” moved forward and worked to catch the edges of the front fields of the first two sections. However, at 20 the young dog was not pleasing Fountain and was picked up. By mid-afternoon the temperatures were in the low 70s. Dynata’s Bound to be Shooting For It All (Fountain) and DuRite’s Katy (Syczylo). “Hailey” drove off the line, moving alongside her bracemate for a short time before taking charge of her own race. At the gap near Merry Mischief Road Hailey was found backing her bracemate. In the next section of open fields point was called by Fountain along a grass edge. No bird located, handler opted for an unproductive. A couple of minutes later handler chose to pick up. Katy moved with speed down the right side of the course, and once independent of her bracemate pushed through the grasses with strength. Syczylo called point at 10 in thick cover. Although Katy’s bracemate was backing, Katy had a breach of manners before handler could successfully flush birds. Millstar’s the Boss of the Plains (Fountain) began the second day as a bye dog. Weather was cool, clear and held sunshine. Boss moved snappily along the right edge. Nearing Merry Mischief Road Boss was pointing, but had breach of manners here and was picked up. Wind Dance Hit the Bullseye (Fountain) also ran as a bye. With speed and strength, Bullseye moved well through the opening fields of the course. At Merry Mischief Road handler called point. Bullseye was buried in thick cover staunch and with impressive style. Bullseye held nicely as the covey flew. Taking the right edge and just before the first stream crossing at 18 Bullseye had a stop to flush with good manners. At the mid-point of the course Fountain picked up this young dog which showed promise to return another day. A huge thank you to all the owners and handlers who brought dogs to the event. For those volunteers who pitched in — your help was greatly appreciated in making this trial a success. The Derby Classic would start at the conclusion of awards and winners’ photo. Winner—TIBERCREEK BILLY THE KID, 1659497, male, by Tibercreek Billy Blazes—Rush Creek Tibercreeks Butter. Mark Calder, owner; Jamie Fountain, handler. Runner-Up—DURITE’S COVEY RISE, 1659018, male, by Durite’s Hoosier Daddy—Durite’s Jet City Woman. Claude Acuff, Jr. & Billy Ring, owners; Carrie Syczylo, handler. Kent Patterson and Rob Donahue continued as judges for the Derby Classic. The morning sunshine continued as brace No. 1 got underway. Temperatures climbed throughout the day and the dry, sandy ground conditions proved to be challenging to several of the young dogs. Bird work would be limited as the day progressed. The winner came from an afternoon brace, P F Teslas Hold’Em, owned by Damon Daniels and Andrea Laria Stott of Indianapolis, Ind., and handled by Robert Tomczak. Tesla exhibited boldness and strength throughout the heat, driving well from the pipe line to the fields near headquarters. Though no birds were pointed, this young Derby was showy with good ground speed. Second was Redneck Miss Kitty, owned by Burnie Stokes of Amarillo, Tex., and handled by Jamie Fountain. From start to finish Kitty took the course forward and dug into cover and edges. Staunch and with style she held her point at the flush. Third was Surfer Dude, owned by Chad Chadwell of Springfield, Ill., and handled by Jamie Fountain. He had a solid forward application and class on game at 16. Winners were awarded Purina Pro Plan Sport and trophy plaques. Redneck Miss Kitty (Fountain) had a forward reaching race from the time she left the line to the finish. At 17 Kitty and Ethos Rolling to the Dark Side (Karen Concilio) were found on point in the open grassy fields. Point was called by each handler and a divided find was carded. The dry conditions presented challenges to these youngsters as they hunted the later section of the course. Riley’s Wiki Wiki Sugar Cane Express (Fountain) and Nitro (Syczylo) broke away from the back section of the one-hour course. At 20 Fountain called point in the piney wood strip; all was in good order. Nitro took a hard move into thick cover at 13 and shortly afterward Syczylo opted to pick up her dog. Surfer Dude (Fountain) had a find at 16 just past a stream crossing standing staunchly. A forward race complemented Surfer’s drive and ability to break into thick cover making his application and finish worthy of a placement. P F Jedi Field Master Durite (Tomczak) drove hard and showed a big, lateral move at 14; his scout was sent for a quick look. Jedi dug into some heavy cover with cross cuts that pulled him away from the front. Syczylo opted for her retrieval unit, ending Jedi’s day. Vezeto’s Mystery of Pandora’s Box (Fountain) and Gunner (Josh Holden) showed a quick pace forward and breaking into cover along the pine tree lines. On this day Gunner had no find and Holden was accepting of the young dog’s need for independence. Maggie’s snappy gait and drive were rewarded with a find at 21. We broke for lunch, participants enjoying another tasty meal prepared by Tippe. Dynata’s Bound to be Firing on All Cylinders (Fountain) and Dell (Syczylo). The continuation of dry conditions proved challenging to “Trudy” and Dell. No birds were found by either dog. Trudy was forward hunting and lacked the maturity of a strong Derby on this day. The retrieval unit was called for by Dell’s handler ending her bid. Dynata’s Bound to Steal My Heart (Fountain) and P F Teslas Hold’Em (Tomczak) had a strong breakaway. “Gigi”, a young Derby, showed future promise with her forward race. At 11 Fountain called point and shot as birds were up. Gigi completed the half hour to the front. Reaching the front, Tesla covered the ground with strength and power. Although no bird was pointed Tesla was named the winner showing the judges her range and application would be rewarded at the end of the day. Sonblessed Smokin the Pipe (Fountain), as a bye, had a quick driving race. At 14 Fountain called point in the thick cover at Merry Mischief Road. A covey flushed. Piper showed purpose along the pine tree lines. The combination of heat and dry conditions may have contributed to her race shortening at 23. A good effort put forth by this young dog. The National Vizsla Association and the Eastern Championship committee extend sincere thanks to all owners and handlers who entered this year’s event. We invite all to mark their calendars now to attend the 2018 Championship and Derby Classic at Di-Lane next February. 1st—P F TESLAS HOLD’EM, 1668276, female, by Vanguard’s Apache Knight—Berry’s Heidi Ho. Damon Daniels, owner; Robert Tomczak, handler. 2d—REDNECK MISS KITTY, 1668927, female, by Kick Em Up Bullet—Redneck Mile Marker. Bernie Stokes, Jr., owner; Jamie Fountain, handler. 3d—SURFER DUDE, 1670583, male, by Lundy’s Red Bull—C K Touchdown Sis. Chad Chadwell, owner; Jamie Fountain, handler.